In Victoria, Australia, on Valentine’s Day, in 1900, three female boarding school students and their teacher disappeared. 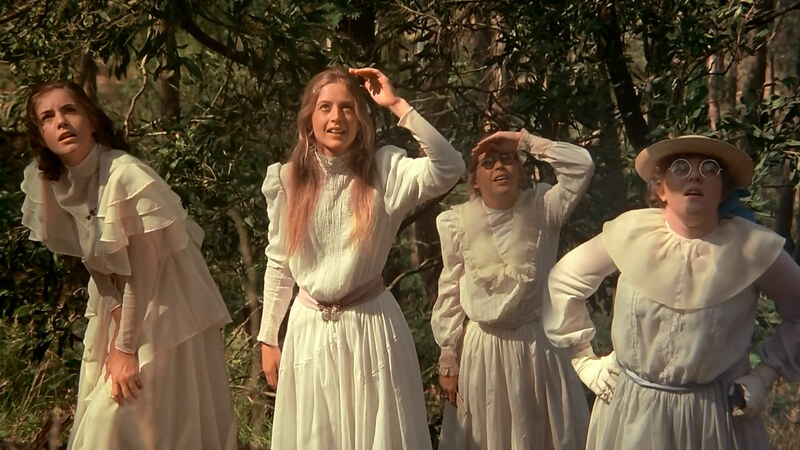 Or so Peter Weir’s 1975 anti-genre classic Picnic at Hanging Rock, adapted from Joan Lindsay’s novel of the same title, shows us. It didn’t actually happen, but that doesn’t matter. It could have happened, and the literal truth of the tale is a red herring contrasted with the emotional truth of the tale. Plus, on the subject of “Western society making play with the world”, few films have spoken more emotional truth than Picnic at Hanging Rock. You might imagine the story on your own: a hard-hitting, grisly dissection of a mystery. A dissection that is very much not what Weir himself had in mind. But then, that’s why we are mere mortals, and Peter Weir is one of the great, underappreciated directors of the modern age. We arrive as members of a school trip to Hanging Rock, a primal, tectonic malformation of raw earth that casts a pall over the film, whispering deviously seductive, secretive nothings in our ears and hinting, in its dank, dark stone crevices, toward the much larger caverns of humanity’s ego. One of the students proclaims that Hanging Rock was “waiting a million years, just for us” early on in the film, looking down on nature as a mere showpiece for civilized society to gaze on at. Picnic at Hanging Rock is, in a nutshell, the story of the Rock having other ideas. It is a film about the Rock as a location, a“voodoo” slithering into the hearts of the characters who use and abuse that location when they even bother to acknowledge it at all. None of the students initially respect the Rock, although they feign that they do. Their teacher half-way gestures toward the Rock’s importance as a reflection of the supremacy of geology in the world and its domain over humankind, but her lazy, heated demeanor suggests she doesn’t really believe herself. Nor do the students; they see the Rock as little more than an escape from the stuffy classroom, but they casually mark their own superiority over the Rock through their classical demeanors and their inability to lose themselves to the majesty of the location. They scoff at the Rock; they feel they are better than it, stopping to read and discuss trivialities rather than let themselves free into the Rock’s surprises. The Rock is but a background to them, passive and tired and lesser than the civilized society they have called home for so long. Again, the Rock begs to differ, beckoning and literally hanging over them, calling on the few who will listen and coaxing them forth, walking them toward its deeper secrets and holding them tight as it gives only enough of itself to beckon these girls forth further. The rest of the class trip shield themselves from the Rock, finding harmony and safety in reminders of civilization they brought with them. When a few girls remove their shoes, another remarks in shock, but the hypnosis of the Rock doesn’t end. It slowly asks, or demands, of the three girls and the teacher who are willing to search further. It asks them to lose themselves to its primitive, primordial mystique, and it is clear, certainly, that Weir and his film crew lost themselves as well. Cinematographer Russell Boyd, who has faced difficulty emerging into the cinematic landscape outside of further collaborations with Peter Weir, doused the film in a soft, hazy lost quality to capture the distance of time and the tragic, unknown allure of the Rock itself. He covered the lens in fabric, not unlike the gauzy technique utilized by Carl Theodor Dreyer forty years before-hand with his seminal quasi-horror Vampyr, also a tale of a mundane person in a strange land. Picnic loses itself to the lust of the Rock, but it is careful to distance the film, to render itself a secret. It is a textbook case, arguably the filmic textbook case, of a filmmaker rendering a location as an alien locale, a location we assume we know until we get there and must confront it head-on. We do return to the boarding school with the rest of the class trip who did not disappear, and from there we return to the rock on expeditions to find the lost girls, cutting back between the two locales over time. We spend a great long time looking for the lost parties, but the central question isn’t the one we might suspect. What happened to the girls is never much of an issue – they might as well have disappeared, and in essence, they did just that. The ones who were lost developed a newfound appreciation for nature, the Rock having handed that appreciation to them, and they lost themselves to this knowledge. They couldn’t return to civilization if they wanted to, and the search party that surrounds their loss is more about that so-called “civilized” European society coming to terms with the fact that nature has in some form taken control over their lives, forcing them to return to the Rock, forcing them to consider the fact that the Rock is a location that has power over them. Throughout, traditional Romanian panpipe themes (played by Gheorghe Zamfir) thickly weigh down on the film, painting the film in a lyrical form of innocence that sounds increasingly sinister, increasingly demented, as the film moves along. It’s a uniquely alien score, one that doesn’t sound like any human-made instrument but like the gentle rumblings of the Rock itself, calling us forth with a beguiling siren’s wail that grows haunting over-time. A score that is contrasted with an almost parodic symphonic score whenever the genteel aristocratic types are lolling about – a score of intentional arbitrariness and lightness so as to sound indifferently pretty and blasé without ever legitimately erupting into any true emotion. It is a mocking score, mocking the very boredom and ponderous, suited-up doldrums of self-serving aristocratic life, rendered all the more mocking contrasted with the sublime panpipe score. A score that also hints at the film’s true horror. We would like to think that the “scary” fact is the way these four people were lost to the mysteries of the Rock, never to be seen again, but, as we learn when one of them returns, the more disconcerting fact still is how divested most of the adult characters looking for them seem. In a clever, transgressive update of Antonioni’s L’Avventura, the disappearance is a MacGuffin, a lens through which to view the malaise of Western society. We aren’t mortified by the fact that a disappearance occurred, but by how little it seems to affect the adults, how progressively distracted the “survivors” are in their everyday lives until they can’t even be bothered to search or care that anyone went missing at all. This is why so few of the individual characters matter at all – they are but spaces in a frame, figures who have been stripped of individual life by the brutal violence of a finishing school that taught them only how to adopt the model of civilized society, how to look down on nature, and how to be like everyone else. A shift that is itself contrasted with the increasingly chaotic, anarchic behavior of the surviving female students, who seem as lost in the Rock’s mysteries, as taken over by its form, as any of the girls who disappeared were. For them, the Rock seems an awakening of sorts. Picnic at Hanging Rock is often compared to Nicolas Roeg’s chilling nihilism parable Walkabout. Both, certainly, are quintessential works of Australian cinema. Both exist around the central theme of European settlers failing to understand the mysteries of the all-seeing nature they now occupied and pretended to rule. Both impressionistically evoke the idea of the “outback” as it exists in the minds of so-called “civilized” folk rather than as it exists in reality. Both take great joy in seeing that idea of a primal, primitive landscape come to life and have their way with the civilization that felt it was better than that landscape. But if Walkabout deals in the horror of events happening we can’t understand, Picnic at Hanging Rock evokes something more damning. Events happen, and we don’t even want to understand them, so much so that the presumed “horror” – the disappearance – becomes less a tragedy than a welcome respite, an escape, from an every day “civilized” life devoid of meaning, joy, or human emotion. The lustful, alien score matched to the lustful, alien cinematography of Hanging Rock, both contrasted with the prim and proper sounds and sights of “civilized” life, consistently hint at a barely repressed layer of steamy sexual exploration, of urges hidden by civilized society that are let free by the Rock. The pathway to Hanging Rock, and the images of the girls in a trance walking into the unknown before they disappear, suddenly become images of freedom, of new life, and possibly of the sort of carnal knowledge that humbly reminds us that we are all animals, even when we pretend not to be.